Did you know there’s over 700 pieces of memorabilia at Seminole Hard Rock Hotel & Casino Tampa and over 81,000 pieces at Hard Rock International? Today we’re shining the #MusicMonday spotlight on Bon Jovi. His brown leather shirt and corduroy pants, worn during his 2008 Lost Highway World Tour, are featured in the newly opened Rock Walk at the Seminole Hard Rock Hotel & Casino Tampa. The world tour went through many different countries such as Japan, Australia, England, Germany and the United States. Bon Jovi even made an appearance in Tampa during this tour and played a sold out concert on April 27, 2008 at the St. Pete Times Forum, now known as the Amalie Arena. In addition to the outfit, the memorabilia case also features a white guitar that was owned by Richie Sambora, but was played by Bon Jovi during Alan Thicke’s “Thicke of the Night” talk show in 1984. 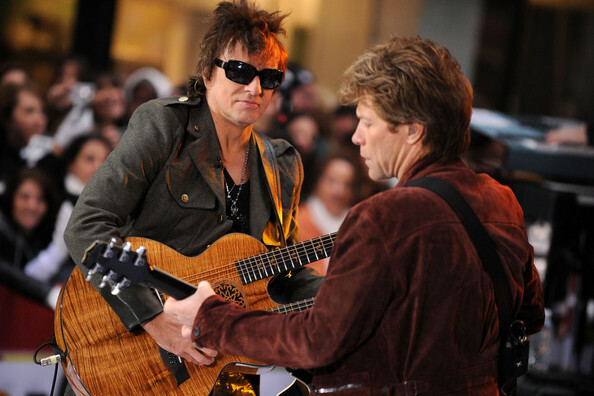 Fun Fact: Richie Sambora and Bon Jovi were born in the same hospital in New Jersey and grew up as friends. The two men were a dynamic duo for many years until one night in Calgary. Sambora decided to call it quits during their tour, Because We Can, in 2013. Rumors came out that Bon Jovi and Sambora had money issues and were fighting. However, Sambora admitted he left the tour to spend more time with his family. Bon Jovi finally opened up about his relationship with Sambora last year. He admitted that Sambora left to spend time with his family and there was no fight between the two men.